In the summer of 2011 I made a portable studio. The cover was made using an ex-army shelter canvas and a domestic sewing machine. 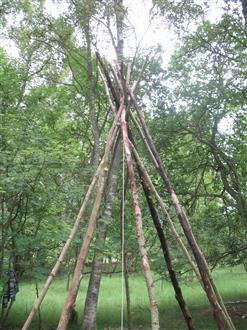 The poles were made from fallen branches. I pitched it in Monkquell Wood in Blairgowrie and worked in the area collecting and recording what I found in the landscape immediately outside the tent. I kept a diary during this time. "The idea is to create a space in which to work that is neither inside nor out, a 'no-mans land', where I can be in two places at the same time. Memories of childhood flood in to my mind. 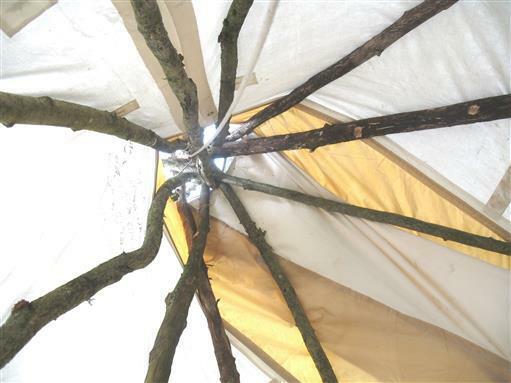 Making tents from sheets, tree branches, anything to hand. 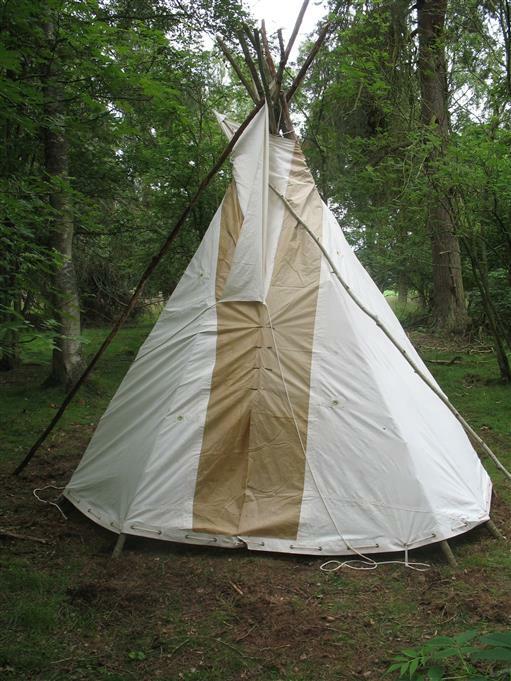 A tent made available great spaciousness within the mind. Sounds and smells passed through the thin walls and the light and shade dancing on the canvas provided endless ideas for the imagination. Observing and collecting material from the woodland allows me to keep my mind in flux, creating a sense of limbo, a conceptual space where ideas begin to develop. The inside space has become a living and evolving workbook. Today, text was used in acknowledgement of the sounds of birds, grass, leaves and trees. Written words intermingled with old verse in the pages of a book entitled "The Charm of Nature" . 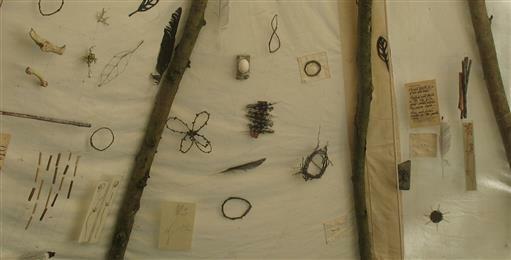 Ancient designs were drawn on bleached twigs and bundled together. Strange objects appeared, disappeared and reappeared in the quest to mould clay in response to the forms and shapes of nature. Drawings were made from pen without looking at the paper. Some were small and intense, others were walked over by harvestmen spiders. Spotted woodpecker feathers suggested a sensibility of age - old treasure. Visitors ambled by, stopped to chat, to observe, to reflect, to make." 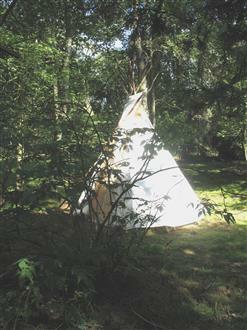 The 'studio' was re-constructed in the garden of the Park Gallery in Falkirk in Spring 2012 and became a sacred space for children to listen to, and to respond to, nature.